Are you prepared to recreate in wastewater? You say “no”? Well it won’t officially happen this summer, but the North Coast Regional Board has begun to consider an amendment to the North Coast Basin Plan that would eliminate the prohibition against summer wastewater discharges. Their purpose would be to allow “incidental” runoff of wastewater resulting from summer irrigation. The low flow issue has become a very complicated subject, but we will attempt to address it as clearly as we can. First, Randy Poole, chief engineer of the Sonoma County Water Agency (SCWA) stated at a recent meeting that “low flow” (minimal summer dam releases) would not be considered in the Biological Opinion due out from the National Marine Fisheries Service (NMFS) in a few months. That document, for the time being, will only address current operations. Many people claim to be environmentalists who care about nature and then do little to protect it. They want clean water, but oppose riparian setbacks. They want clean air, but they drive SUVs. They mean well, as long as it is convenient. They don’t intentionally mess up, but fail to realize that, nature is part of us, and ultimately has the last word. It is complex and resilient, but can be irrevocably altered so that our future and our way of life may be at stake. We can’t live without clean water and clean air. That is the truth! The good news is that Santa Rosa intends to get most of their wastewater out of the river between October 1st and May 15th each year, by sending almost all of it to the Geyser’s steam fields. The bad (and ugly) news is that they are promoting the allowance of “incidental” discharges during summer when flows are low, human use is high, and waterways are more vulnerable to pollution. Year 2007 has been an extremely active year for water and wastewater issues in Sonoma County. Russian River Watershed Protection Committee (RRWPC) has tracked numerous issues and written about them in the Gazette this year. Here’s a year-end summary. Discharge: Santa Rosa has been actively developing a Russian River direct discharge. Early in the year they eliminated studies of indirect discharges along with the direct discharge immediately downstream of their water intakes. Remaining are two discharges in the Healdsburg area and one just downstream of Steelhead Beach in Forestville (near Russian River Utility’s well). The City recently released 3 of the 6 documents containing studies of these projects on their website. Remaining documents will be released by early spring of 2008. The Russian River County Sanitation District (RRCSD) needs additional storage capacity at the treatment plant in order to keep it from discharging contaminants into the Russian River during high water periods. 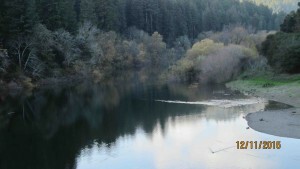 Russian River Watershed Protection Committee (RRWPC) agrees that it is necessary. According to official documents, approximately 30 million gallons of storage is needed in order to fully serve current ratepayers under all river flows. RRCSD currently has 3.5 million gallons (mg) of storage, and the proposed new storage basin would give us 3.5 mg more at a cost of $4.5 million dollars.